A sincere attempt to combine an old-school disaster movie with a post-28 DAYS LATER horror picture for our paranoid, pandemic-fearing 21st century culture, this opens with alarming, harsh scenes of London in quarantine as a result of a global pandemic, and a kid fleeing as his mother is blown away by the military. 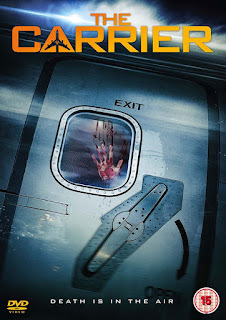 After this jolting opener, things slide into the routine and vaguely silly as the virus spreads on a seemingly secure 747 containing a small group of survivors escaping from the capital. A plan to take refuge in Greenland with another plane’s passengers, inevitably, fails to result in the hoped for happy ending. Director Woodley keeps things moving at a reasonable pace, employing some gruesome (if borderline unintentionally amusing) make up for the infected and taking occasional diversions into visceral territory (notably a hammer / chisel amputation), but it’s blandly acted and the necessary sense of impending doom is notably absent. The CGI is variable, albeit not terrible, and the lack of intensity is reflected by the passenger who still gets the munchies for complimentary in-flight nuts even when everything has gone to shite.